So far this year we haven’t had the 3rd "retailer incentive" cover variant that the IDW monthly Disney comics used to have last year. They are going to be back next month though, starting with another blank "sketch" variant just in time for the convention summer. But this month we got another special 3rd variant cover. 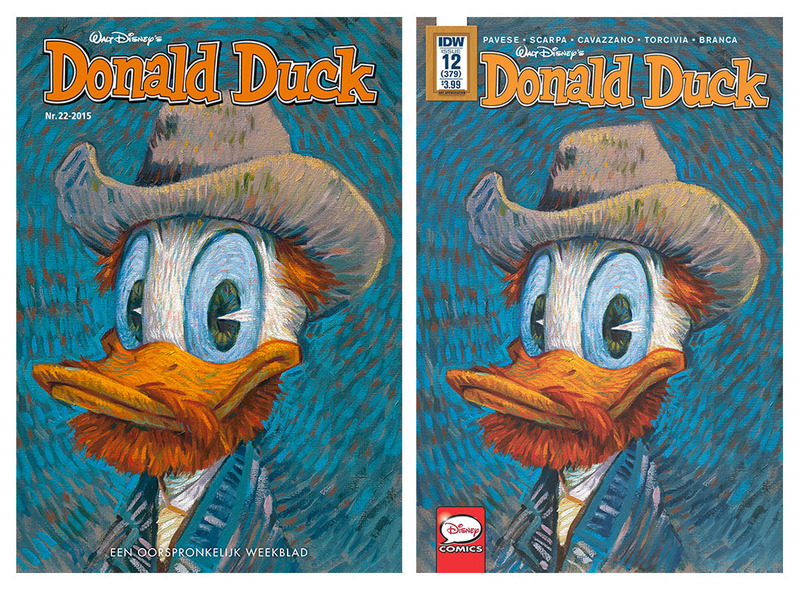 IDW is having an Art Appreciation month in April, where selected series get an extra variant cover celebrating famous art. 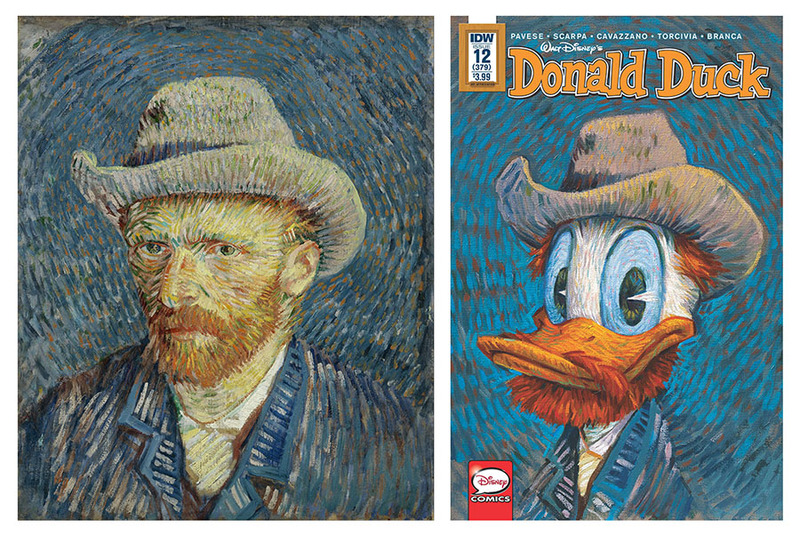 Donald Duck is one of those series (the only Disney one), and the cover is a parody of Vincent van Gogh’s painting "Self-portrait with grey felt hat". It’s actually not a newly made cover for this IDW event, but a painting the Dutch artist Wouter Tulp made for the "Van Gogh Year" (125 years after his death) in 2015. And the painting was exhibited at the Van Gogh Museum last summer. The painting was also used as a cover for a Dutch Donald Duck comic last year, and as IDW’s Donald Duck logo is the same as the Dutch one the two issues looks almost the same! 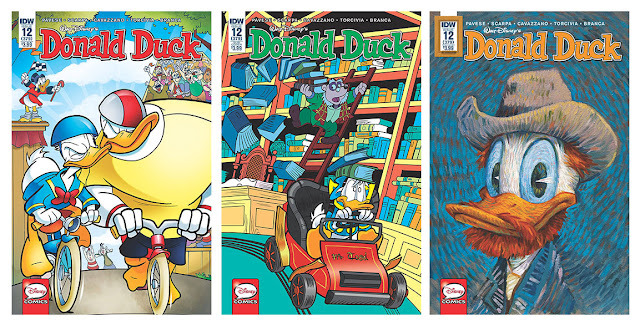 We also got a couple of interesting stories in IDW’s Donald Duck #12. First we have Vicious Cycles, another story drawn by Scarpa – but this time written by Osvaldo Pavese. Doing a quick search in inducks it looks like this is the first story written by him that is published in the USA. 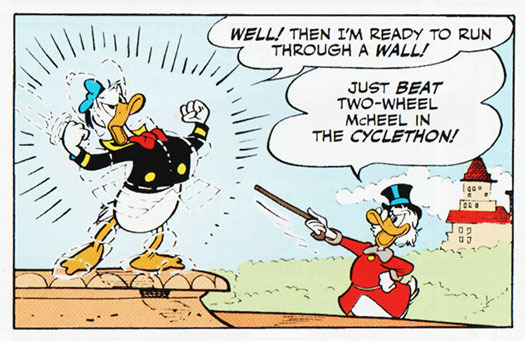 The story starts with business rivalry between Scrooge and Rockerduck, both having their own brand of bicycles called McDuckernaut and Thunderbolt. I’m not sure if McDuckernaut is wordplay for Juggernaut or something else, but part of the original pun might have been lost in translation. In Italian they are called Saetta and Folgore i.e. two names for the same thing. So Lightning/Flash and Thunderbolt might have sounded better imo (but it's not a big deal). This story has a lot of similarities with the Barks story Bubbleweight Champ. The boxing and the cycling champs are not only similar looking, but in Italian they even had the same name! In English they are called Boldan True and Two-Wheel McHeel, so the similarity is not that obvious. But we also have the boys as coaches and kind of a similar outcome. And we have the same milk/soda drinking joke. The next story is Free Spirits, the first story with Sonny Seagull ehm, I mean Garvey Gull. It’s actually not the first story with the character printed in the USA. He also had a small role in Healthy Choice published in Gemstone's Mickey Mouse Adventures #10. The character's English name in Egmont scripts is Sonny Seagull, but Gemstone decided to change it for the American printing. 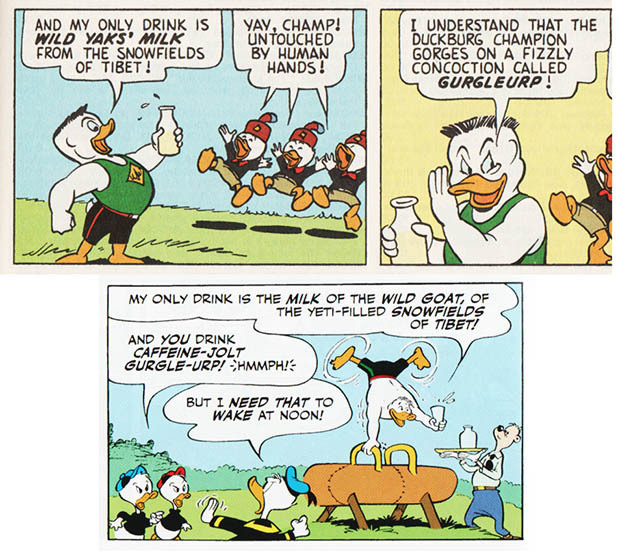 The reasoning was that Garvey Gull was a more tougher-sounding name for his mischievous characteristics, and that Sonny could be mistaken as slang for "kid" instead of his real name. Personally I think the name Sonny Seagull sounds a lot better, but I’m not American so I can’t really tell what is best sounding for American readers. By introducing the character with his first story, I’m guessing IDW plan on printing more stories with Garvey in the future. And that is good news for readers unfamiliar with this free spirit! I’ve read all stories with him and there are some really good ones! Egmont haven’t produced any new stories with Garvey and Phelps in a while – but I hope they will soon. Because I got a bit jealous of American readers right now, I want to read new stories with Garvey too! If anyone reading this can check, I’m wondering if Garvey’s full name was used in "Healthy Choice"? I have a feeling he was introduced there only by his first name "Garvey". (I don't have the issue handy to check) The full American name is used on the Disney Wiki and added as alternative name in inducks, but is "Free Spirits" the first time we actually have seen the full name on print? 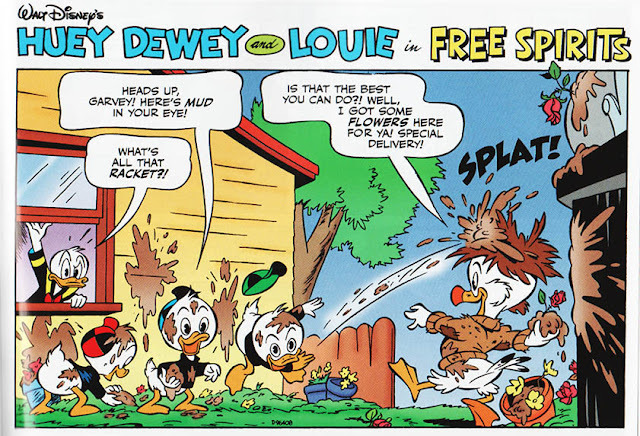 Also, I suspect "Free Spirits" is a leftover from Gemstone, that never made it to print back then. Pat McGreal did some translation/dialoguing for Gemstone, but (so far at least) not directly for IDW. Actually, Garvey's full name was indeed used in "Healthy Choice" (Daisy: "Garvey Gull! This is a SALES war! We want CUSTOMERS, not prisoners!"). "Free Spirits" wasn't a leftover from Gemstone—Pat indeed dialogued it directly for my colleagues at IDW. It makes sense to have Pat doing the dialogue as he wrote several Garvey stories. I think there’s a lot of unused potential in this character, so maybe this makes him inspired to write a new story (*hoping*). Garvey as a friend of the boys works better than the I-Team I think, I’m not a huge fan of those stories. I do like the name "Garvey Gull" better than "Sonny Seagull." "Sonny" seems both too generic and too dated. I know the name was chosen (by Charlie Martin?) in the 1990's, but it sounds like the 1950's to me. I like the fact that Garvey's happy-go-lucky hobo status leads to escapades that are more outdoorsy and less supervised than the bulk of the leisure activities of contemporary Western kids, whose overscheduled lives allow for only virtual adventures. I read an article in the 1990's about children's books, which observed that most of the award-winning children's novels written recently were not set in contemporary America. They were set in other lands with less developed economies, or they were set in the USA decades ago. The article claimed that this was because contemporary American kids can't have adventures, because their lives are too scheduled and supervised. They can't roam around town on their bicycles (as I did as a kid in the 1960's) and meet people who aren't on their parents' schedule for them. If we think of HDL as contemporary American kids, Garvey has the merit of getting them off their smartphones and sparking adventures where the kids have some autonomy. True, being Junior Woodchucks gets them outdooors—but Garvey makes more freewheeling adventures possible. 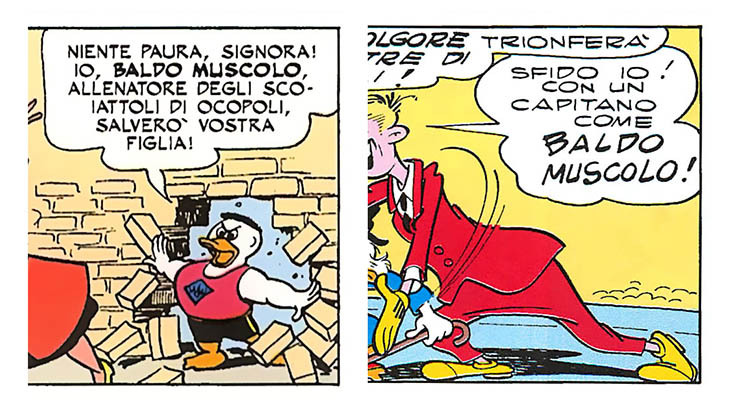 Listen, I had not noticed that, but I'm 99 percents sure that the two Baldo Muscolo were supposed to be the same character and that the translator was mistaken. 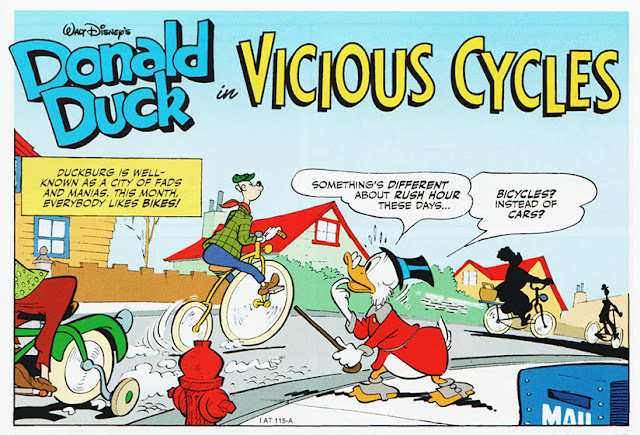 It’s hard to tell if the cyclist character is inspired by Barks’ Junior Woodchuck coach, or intended to be the same one. They have differences too. But IDW already named the doctor lookalike in "The Chirikawa Necklace" for Doctor Proctor and started calling the Italian looking Grandpa for Blackheart. So it would make sense to use the same name in this case too. I don’t look at it as a mistake or problem though. Hex: it would absolutely have made sense! But I'll own up to its being a mistake: mine, not the (excellent!) translator's. Pavese and Scarpa definitely intended their "Baldo Muscolo" to be the same as the "Baldo Muscolo" in "Bubbleweight Champ"; the dead giveaway is that his dietary habits, hair, and brawny chest are similar. But apart from those features, he is drawn somewhat differently—much taller and more exaggerated; perhaps as a result, Inducks overlooked the connection (more typically, they would point it out), and none of my Italian contacts mentioned it either. So in an annoying slip-up given my intent to be continuity-conscious, I erroneously told my translator, Joe Torcivia, that "Baldo Muscolo" in "Vicious Cycles" was an original character. It was easy to do, given that I don't usually have much of a background in the 1960s Italian localizations of Barks stories. Jonathan Gray, uninvolved in this project, happened on an Italian "Bubbleweight Champ" last week and was the first to discover the mistake. While I'm very pleased with how our "Vicious Cycles" turned out otherwise—and while I love the name Two-Wheel McHeel!—I'm still irritated at my slip-up.